Add Bluetooth function to TV, DVD, PC or any audio source device. Simply use standard 3.5mm audio cable or RCA cable connect BE-TX to your TV's audio output and wirelessly stream music to any Bluetooth enabled headphones, speakers or audio receivers. Thanks to the bluetooth V4.1 technology and external antenna, you could enjoy the long range working distance in the line of sight. Extend your streaming audio from indoors to outdoors. For the maximum range, the included antenna must be firmly connected to the back of the BE-TX transmitter. BE-TX could stream audio to two bluetooth headphones/receivers simultaneously. You may share audio wirelessly with your friend and won't disturb others. AptX Low Latency technology eliminate Bluetooth audio delay, so you can watch TV / Movie / Video and listen to high-clarity sound in perfect synchronization. NOTE: To benefit fully from Low Latency technology, use this transmitter with a Low Latency supported Bluetooth receiver or headphones. The Besign BE-TX uses a Micro-USB jack for power; use it with the included wall adapter, or any compatible wall adapter, then you could enjoy your wireless music for continuesly playing. IMPORTANT NOTE---This BE-TX could connect with your TV, Media player via Aux Cable, and make these devices bluetooth enabled. No bluetooth connection with your smart phones ( iPhone, Samsung, Huawei, Etc), Tablet, iPod Touch or PC; but this BE-TX could connect with these devices via Aux cable and make these devices bluetooth enabled with this BE-TX, then bluetooth connection with Bluetooth headphones, Bluetooth speakers or Bluetooth receivers. No bluetooth connection with your Wifi speakers. Long Range Wireless: Thanks to the Bluetooth V4.1 technology and external antenna, you could enjoy long range working distance in the line of sight. Extend your streaming audio from indoors to outdoors. For the maximum range, the included antenna must be firmly connected to the back of the BE-TX transmitter. 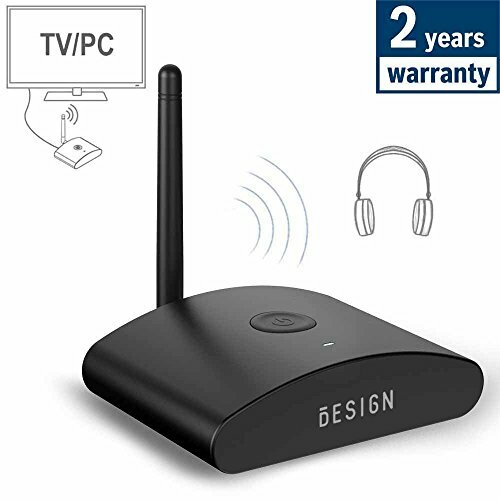 Wireless Audio Streaming to Bluetooth Speakers/Headphones/Receivers: Use this Bluetooth Transmitter for streaming wireless Audio from your TV, PC, Laptop, iPod, Amplifier or other Audio Device. Important Notice: Please make sure your TV or Amplifier or Audio device has an analog audio output, incl. 3.5mm headphone jack OR white / red RCA audio out. Low Delay: aptX Low Latency technology eliminate Bluetooth audio delay, so you can watch TV / Movie / Video and listen to high-clarity sound in perfect synchronization. NOTE: To benefit fully from Low Latency technology, use this transmitter with a Low Latency supported Bluetooth receiver or headphones. Aux, Optical & Coaxial Audio: To achieve optimal high-definition sound quality, the BE-TX Bluetooth Transmitter offers several ways to connect to your TV/DVD, including a digital coaxial audio out, a digital optical audio out, and a traditional 3.5-millimeter-to-RCA connection. If you have any questions about this product by BESIGN, contact us by completing and submitting the form below. If you are looking for a specif part number, please include it with your message.